On August 17, 2015, The Johnson County, Indiana newspaper Daily Journal published a column by Dan Thomasson “Reasons persist to steer clear of home schooling.” His column contained many errors of fact and misleading conclusions that need to be corrected. "...the do-it-yourself approach is basically unregulated..."
His first error is the assertion that “the do-it-yourself approach is basically unregulated…” The truth is that in Indiana, homeschools are considered nonaccredited private schools, and thus must comply with Indiana’s private school statute, found in Indiana Code Title 20 Article 33. At a minimum, homeschooling families must provide equivalent instruction in the English Language, teach for 180 days, keep attendance records, and provide information to the state, if required. Other states’ requirements vary. Homeschooling is regulated, as is all education. 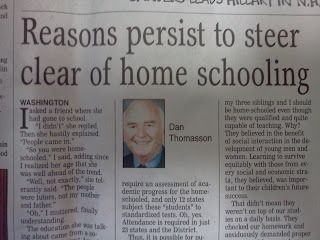 Mr. Thomasson’s words that homeschooling is unregulated are incorrect. "...taxpayers have been wasting their money, big time..."
His next error is the conclusion that “If high school dropouts can teach as well as professional educators, taxpayers have been wasting their money, big time.” As I read this, I wonder if he would have us think that the homeschooling community is characterized by uneducated buffoons who let their kids run amok and play video games instead of reading books. When my kids were younger, my wife and I were homeschooling parents. I have Bachelor’s Degree in Accounting and a CPA license. My wife has a Bachelor’s Degree in Nursing and holds a Registered Nurse License. The homeschooling community I know includes parents with degrees and/or careers in physics, information technology, English, pharmacy, divinity, business, and even education. Yes, trained teachers know and appreciate the value of homeschooling. While we do not all have college degrees, let alone formal teaching certifications, we do have the most important credential of all: we are our kids’ parents and we are ready, willing, and able to prepare our children for the blessings and responsibilities of life. Mr. Thomasson, I will grant your point that homeschool children are not subject to standardized testing. On the other hand, even a cursory following of ISTEP’s recent woes ought to lead any parent, regardless of education philosophy, to wonder if being subject to these tests leads to superior education. Mr. Thomasson should also know better to perpetuate the myth that homeschool students miss out on what he calls the “social interaction in the development of young men and women.” You can disprove this yourself by going to your favorite internet search site and typing something such as “homeschool groups Indiana.” My search returned countless support groups. You will find connection opportunities for kids and parents alike. Not just for instruction, either. My kids got exposure to martial arts. Friends’ kids play baseball and football. From sports to 4-H to art classes, I will admit there is a problem with homeschool students and socialization. The problem is what to choose from among the abundant choices available? Circling back to Mr. Thomasson’s assertion that homeschooling “…is based on any number of beliefs that the public school system is contaminated by godlessness, incompetence and danger, among other things…” The truth is that different kids learn best in different environments. Some learn best at their community (public) school. Some best at a private school. Some best at home. Some, like our family, learn best by beginning at home and transitioning to community schools. Each family owes it to their kids’ futures to know and pursue the best paths. 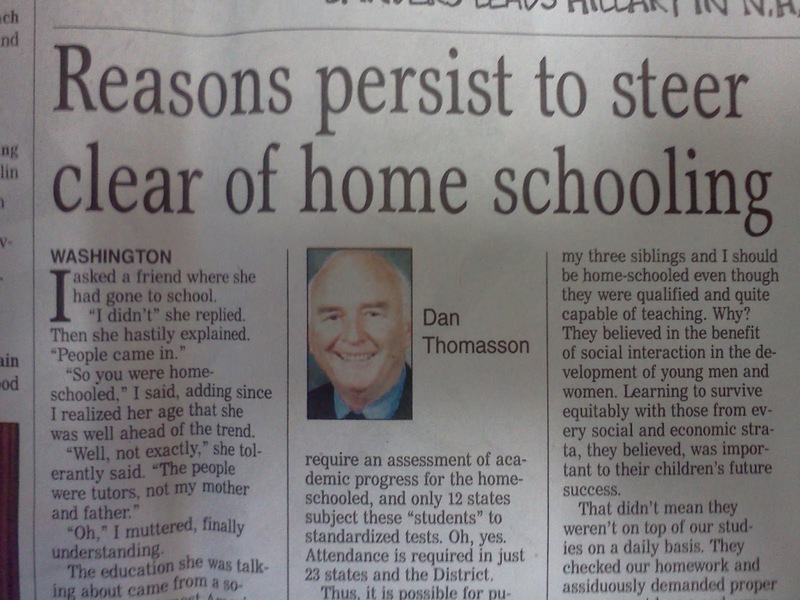 Dan Thomasson’s column headline reads, “Reasons persist to steer clear of homeschooling.” When the truth is known, there are reasons to steer clear of his views and conclusions about homeschooling.